Uhm, excuse me, but is today really the first day of 2015? Where did 2014 go? It went so incredibly fast. This is the blog post that typically covers the topic of goals, resolutions, and commitments. Well this post is too but with a slightly different approach. If you are anything like me, I struggle with goal setting. So I avoid them this time of year. I know that I will more than likely forget them by the end of January. For a long time I have thought there was something wrong with me or that I just wasn’t self-disciplined enough to follow-through. With the new year upon us, this issue has been on my mind a lot. I have big ideas for 2015 and that will require some big goals and consistent action steps to bring these ideas to life. Not long ago while listening to a webinar, I was struck by what the speaker was saying about the ability to focus. He said that struggling with focus is a strong sign of lack of clarity. Oh my, that was a BIG aha for me. While I know I have a more than enough room for improvement in the self-discipline area, lack of clarity is also a huge contributing factor in not setting and reach goals. I talk about knowing your why quite a bit, but sometimes it takes someone else saying the same thing to realize you need to take your own advice! This idea of lack of clarity has turned my thinking around and given me hope and an action plan. If I am not clear on what I want to accomplish and more importantly why, I am going to struggle with setting a goal, wondering if it is the right goal to go for, let alone working to make it happen. 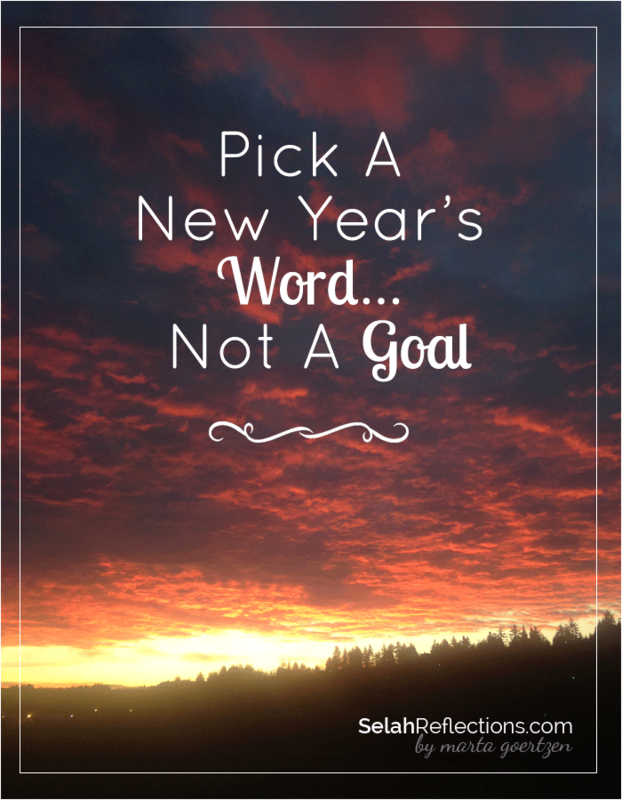 Have you heard of the one-word or theme idea instead of new year resolutions? The idea is to take time to carefully and prayerfully consider the coming year and what you would like to accomplish and pick a word or a theme for the year. Notice how you speak to yourself, “I’m such an idiot!”, “Well that was dumb Marta”. We can talk so negatively to ourselves. By selecting a positive theme for the year, a positive idea and self-talk to replace the negative, what a difference that could make in our lives. Your word does not need to be anything fancy. Connection, Church, Family, Relationships, Adventures, Healthy, Simplify etc. The word you choose will be personal and meaningful to you. The first time through the process, my word ended up being Simplify. That idea made me think differently about things in general. My schedule, what I said yes to, my business, my belongings, my hobbies etc. Last year I did not go through the process and I can see a bit of wandering around and not accomplishing as much as I had hoped. Not all of that is tied to not selecting my One Word but I can definitely see how not choosing affected some of my decisions. Author and Entrepreneur Chris Brogan takes this idea one step further and selects 3 words to help create a foundation for his focus and goals for the year. You can read more about the words he has selected over the years and why here. Maybe choosing just one word sounds incredibly hard, I hear you! So don’t. Choose 3 :). Giving yourself visual reminders of your selected words in a beautiful, creative way is just one way to help keep these words front and center. Without these visual cues and consistent review, your words, goals, and dreams will be forgotten and will be lost in the craziness of everyday life. You will lose momentum and focus. If a collage isn’t your thing, type up the words and put them on a bulletin board, draw them in your journal, make a bookmark for your Bible, create a Pinterest board. Just keep them somewhere where you can see them,be reminded of them and remember to pray about them. For 2015 I’m going a bit wild and selecting 4 words. Over the past couple of months these 4 have come up time and again. Simplicity: I seem to always go back to this word. Between business, family and attempting to have a personal life it all feels so complex and unmanageable at times. I will continue to look at simplifying my business, my belongings, commitments, and activities. Creativity: This is a big one for me My creative side must be itched! It is a stress reliever, sharpens and refreshes my stressed out brain, and helps me become a better problem solver. Creating time to create is a must. Rest: 2014 has been a year of push, 2015 has to make time for more intentional, deliberate rest. Real rest and rejuvenation. If I don’t my physical and mental health will continue to take the hit. Outdoors: Adventures, explorations, treasure hunting, walking the dog and exercising, this is what the outdoors means to me. It is refreshing, exciting and healthy to explore the hiking trails, the long walks on the beach or sitting on the front porch. Getting outside even more this year will be important. Check out the book, read the blog post and decide if this year you will choose a word or set of words. If you had to choose right now, what is the first word that pops into your head?